The University of Notre Dame will host an exhibition of William Shakespeare’s First Folio next January. The University of Notre Dame will celebrate Valentine’s Day with the fourth annual SonnetFest — a communitywide public reading of Shakespeare’s 154 sonnets as interpreted by members of the Notre Dame and Michiana communities. 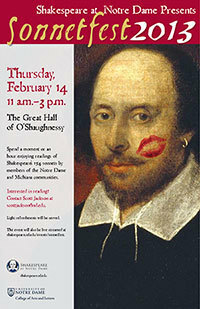 The event will be streamed live online for the first time this year at www.shakespeare.nd.edu.